EPISODE SUMMARY: How to Increase Affiliate Commissions & Five Actions You Can Take Right Now, Right Now… Let's Get Started. Looking for specific actions you can take right now to increase affiliate commissions? Let's talk about on it on this week's episode of Unstoppable Affiliate TV. ✅ The B.L.I.S.S. Method for Increasing Affiliate Commissions. Leave a Comment & Let's About It! Who Else Needs Help? 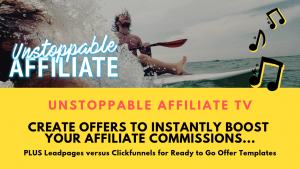 Get Our Unstoppable Affiliate Blueprint Here! Spread the Word & Enter Our Cash Giveaway!